The first virtual museum in the world entirely devoted to the history, evolution, science, sociology and art of Carrots. The mission is to educate, inform and amuse visitors through the discovery, collection, preservation, interpretation and exhibition of objects relating to the Carrot. 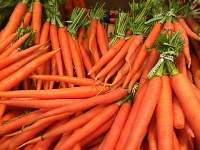 This site provides lots of interesting and useful information about the humble carrot. © Copyright 1996-2019 World Carrot Museum. Important Note: The information provided in EVERY page of the website is done so in good faith. The website contains information which is for general information purposes only. Whilst the World Carrot Museum endeavours to keep the information up to date and correct, it operates a system of continuous improvement to this information. Accordingly no warranty is given as to the accuracy, completeness, reliability or suitability with respect to the website or the information, advice or opinion contained on the website for any purpose. Users who rely on the information contained in this website or any part of it do so at their own risk. The World Carrot Museum does not represent or warrant that the information accessible via this website is accurate, complete or current, and has no liability whatsoever in respect of any use which you make of such information.